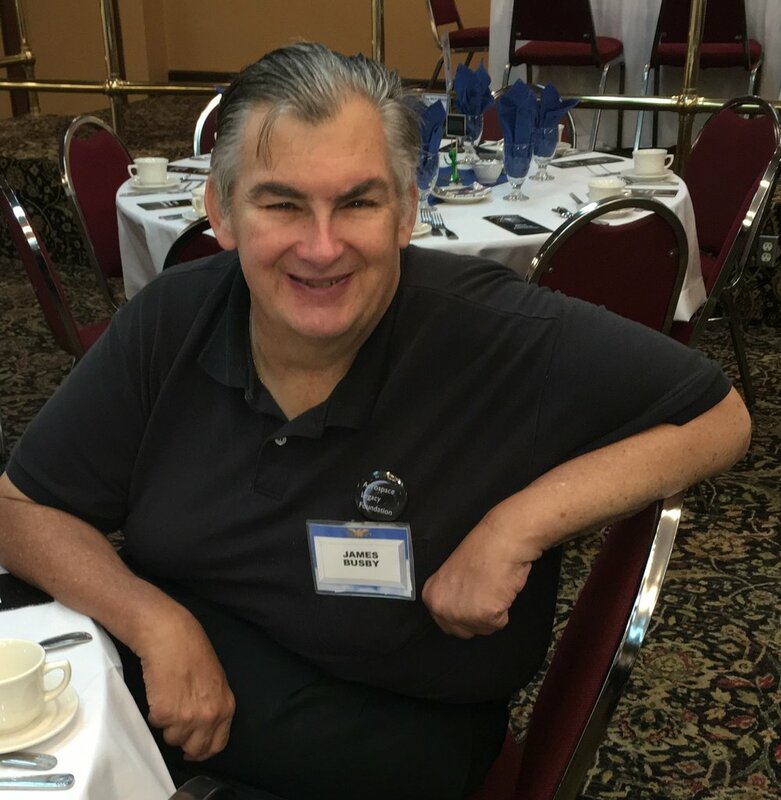 The luncheons were a time to reminisce with old friends and colleagues. Ed Rusinek (right) speaks humble words of praise for the North American Bald Eagles group during their last luncheon. 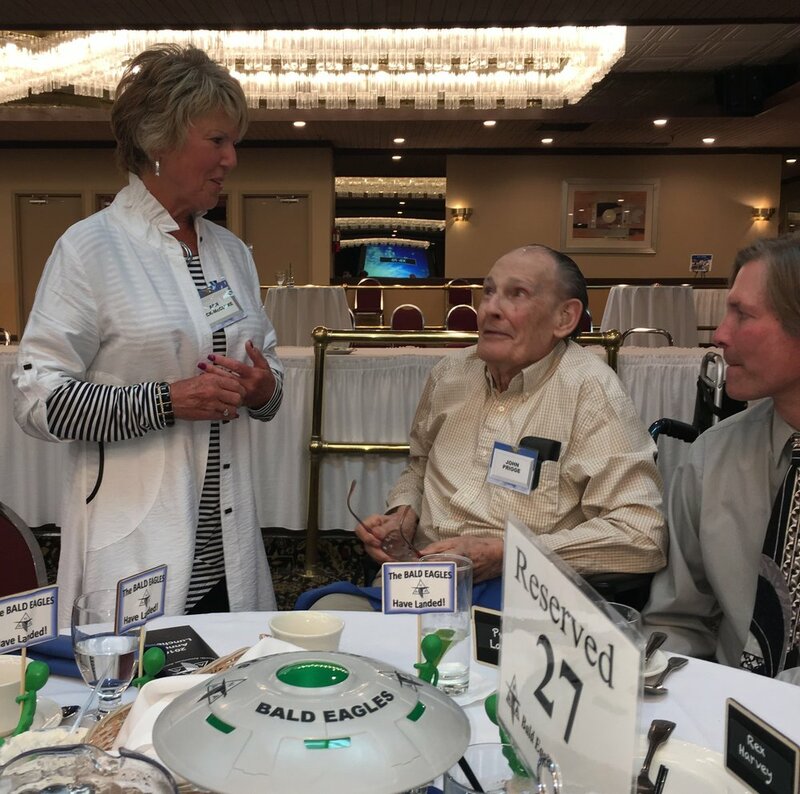 James Kindelberger Graham (center) accepts a beautiful F-86 scale model from the North American Aviation Bald Eagles at their 55th and final luncheon. Sam Iacobellis (right) visits "Bald Eagle" comrades. "Incorporated on Dec. 6, 1928, North American Aviation’s formation followed the founding of the Boeing Company in 1916 and Douglas Aircraft in 1921. For its first few years, North American operated as a holding company, owning parts of many other aviation firms, including Douglas and General Aviation Manufacturing Corp. in Dundalk, Maryland. In 1934, federal antitrust legislation required that the company give up its holdings in other aircraft companies. At that point, under engineer Dutch Kindelberger and designers Lee Atwater and J.S. Smithson, North American became an aviation manufacturer, moving into General Aviation’s plant at Dundalk. Its stay there would be temporary. After the company won its first airplane contract for 42 NA-16 trainers in 1935, Kindelberger began moving North American’s manufacturing operations west. He built temporary quarters in El Segundo near the southeast corner of Los Angeles Municipal Airport, more than a decade before it became Los Angeles International Airport. The company rented 20 acres there for $600 a month. A permanent factory was finished on the site and occupied in January 1936, with 250 employees. The NA-16 trainer, the first U.S. military plane to have an official model number, which would evolve into the BT-9 and then the AT-6 Texan, became an important aircraft in the training of American and British pilots. The company focused on such smaller planes at first, choosing not to compete with larger operations which could produce bigger, multi-engine planes. "The B-25 became famous when Col. Jimmy Doolittle (below) used them in his famous raid on Tokyo on April 18, 1942. Immortalized in the book and film “Thirty Seconds Over Tokyo,” The Doolittle raid was the first U.S. air attack on the Japanese mainland and was an important morale booster early in the war effort." "Perhaps the company’s most outstanding wartime achievement was the development of the P-51 Mustang fighter. The plane grew out of Great Britain’s desire to purchase more P-40 Flying Tiger fighters from the U.S.
Lee Atwood convinced the British that North American could provide it with an even better fighter. A prototype of the proposed new design was rushed into production and first flew on Oct. 26, 1940. Britain had the planes in service by April 1941. Its first engine had performance problems, but once Rolls Royce engines began to be used in the P-51s, their superior performance made them one of the most important Allied weapons of the war. By war’s end, more than 5,000 P-51s were in service for the U.S. "...The company turned out more than 40,000 airplanes during the war, including 9,498 B-25 Mitchell bombers, 15,586 P-51 Mustangs, and 15,498 trainers of various types. North American built 14 percent of all aircraft produced by U.S. manufacturers for the war effort. The firm’s orders dropped off rapidly after the war ended, causing it to close its plants in Kansas City and Dallas. North American engineers already had been working with the new jet engine technology, and now that effort moved forward quickly with the company producing a variety of postwar jet fighter designs. Edgar Schmued and Dutch Kindelberger. Along with others like Ken Bowen, they made the P-51 Mustang a real winner for the Allies in WWII. 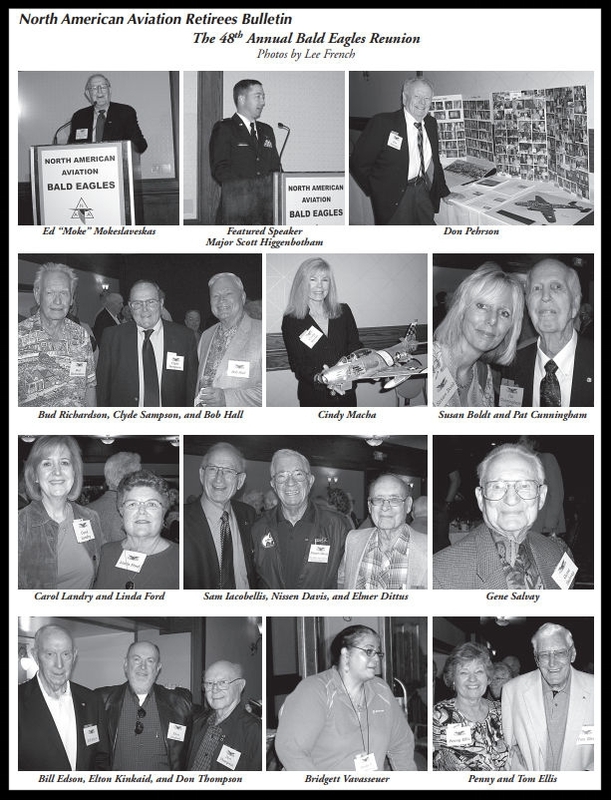 ... spoke at the North American Bald Eagles Retiree luncheon Saturday April, 29. American aviation pioneer who led North American Aviation from 1934-1960. Dutch Kindelberger with Prince Bernhard and grandson "Jimmie". Above- 46th Annual NAA Bald Eagles Runion. Image- Lee French. Summer 2008 Bulletin. 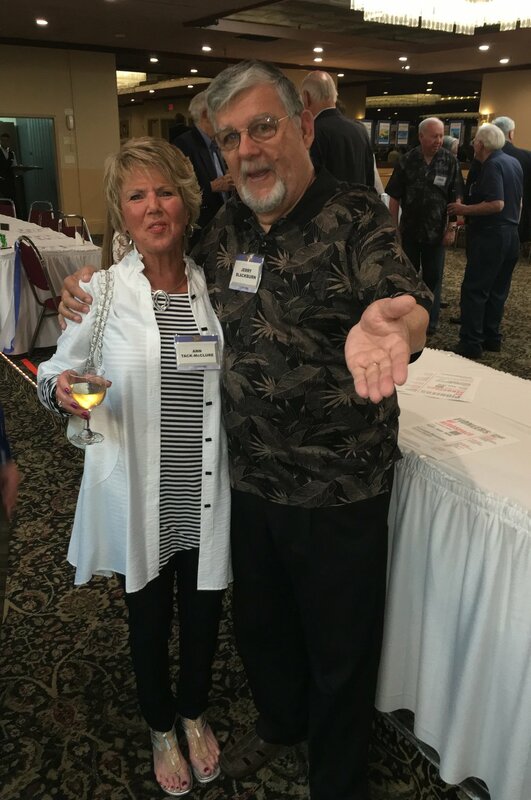 47th NAA Bald Eagles Reunion. Images Lee French. Summer 2009 Bulletin. Above- 48th annual NAA Bald Eagles Reunion. Summer 2010 Bulletin. Lee French. Above- 50th Annual NAA Bald Eagles Reunion. Color images here. Above- 50th Annual NAA Bald Eagles Reunion. Summer 2012 Bulletin. Above- 52nd NAA Bald Eagles Reunion. Photos by Lee French. Summer 2014 Bulletin. Above- 53rd annual NAA Bald Eagles Reunion. Summer 2015 Bulletin. Image- Sandy Snow. Above- 54th Annual NAA Bald Eagles Reunion. Summer 2016 Bulletin. Images Sharon Simonsen.